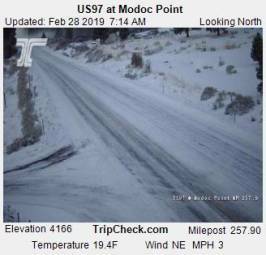 Webcam Modoc Point, Oregon: US97 at Modoc Point - A view of the current traffic situation on the US97. Klamath Falls, Oregon: Plum Hill, 14.7 mi. Lake of the Woods, Oregon: ORE140 at Lake of the Woods, 17.5 mi. Hilt, California: I-5 California at North Hilt, 49 mi. Chemult, Oregon: US97 at Chemult, 53.1 mi. Medford, Oregon: Medford Weathercam, 53.4 mi. Lava Beds National Monument, California: Lava Beds Visitor Center, 53.6 mi. Applegate, Oregon: Tallowbox Mountain, 67.8 mi. Paisley, Oregon: ORE31 at Paisley, 70.4 mi. This webcam Modoc Point, Oregon with the theme Traffic was added on February 19, 2015 and is operated by Oregon Department of Transportation. It got 90 visitors since then. Shouldn't this webcam work or should the link be wrong please report that here. You can add this webcam here to myCams.